The manual coding tools in Tobii Pro Studio and Tobii Pro Lab provide the flexibility to count and analyze behaviors or occurrences that are meaningful to the researcher but that are not provided for in the default feature set. Manual coding can also dramatically reduce the time required to analyze gaze on a dynamically changing scene such as commonly found in Tobii Glasses or Pro Glasses 2 recordings. While Studio lets you generate 12 different fixation-related metrics at the click of the mouse, there is no easy or automated way to count instances of looking to target A directly after looking at target B or a hand pointing at a package. This can be achieved easily, however, by using the Coding Scheme tool. When using the Tobii Glasses with the Smart IR marker system, gaze to a predetermine shelf, poster, or interface can be easily and quickly aggregated over multiple participants. But if you’re using either of the Tobii Glasses or Pro Glasses 2 in a free-roaming discovery task, you might not know beforehand what people may look at. Setting up Dynamic AOIs is an option although in some cases, creating and modifying AOIs can turn out to be laborious. In both of these situations, the manual Coding Scheme tool can be a more time efficient and effective analytical tool. The offline Coding Scheme tool is found in the Tools menu in Studio (Glasses) or in the Event Types tool in the Pro Lab. Clicking on it brings up the initial setup window. 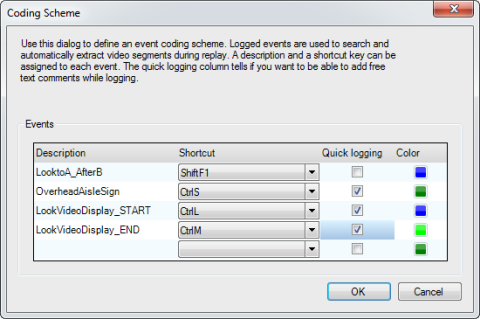 Here you have the options to name the code, designate a keyboard combination shortcut or hotkey, provide for the option to annotate at the time of coding, and pick the color of the timeline event marker. Se screenshots for an example we’ve set up with a few example codes. Now that we have generated a bunch of codes for the events of interest, the next step is to do something with the data. To accomplish this, go to the Data Export tab and select the fields to be exported to a tab separated variable (TSV) text file or XLSX Excel workbook. Select the fields of interest and make sure to include a timestamp (RecordingTimestamp is recommended) and the event marker fields: StudioEventIndex, StudioEvent, and StudioEventData (or just Event in the Lab software). Here is what the resulting export file will look like for a simulated Glasses recording. So there you have it. The manual Coding Scheme tool is easy to set up, straightforward to apply, and provides data that is easily analyzed to get at the questions that researchers are interested in like interest, visibility and visual attractive power, noticing, navigation, and more.